Chefs look for products that can help them deliver their menus consistently. 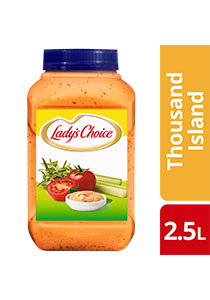 Made with real quality ingredients, Lady's Choice Thousand Island Dressing helps you to deliver consistent salad dishes. Soybean Oil, Sugar, Vinegar, Gherkin Relish, Egg, Chilli Sauce, Tomato Paste, Permitted Modified Starch, Mustard, Salt, Spices, Permitted Edible Gum, Permitted Preservative, Permitted Calcium Disodium EDTA. All additives are of plant and synthetic origin. May contains traces of cereals containing gluten, soy, fish, egg, peanut and milk. The flavourful Thousand Island Dressing is tangy and combines the best ingredients of real tomato paste and chunky gherkin relish that are ideal as a dressing for your salad greens and as a dipping sauce. Keep in a cool & dry place. After opening, keep refrigerated at 4-10℃. Do not freeze.